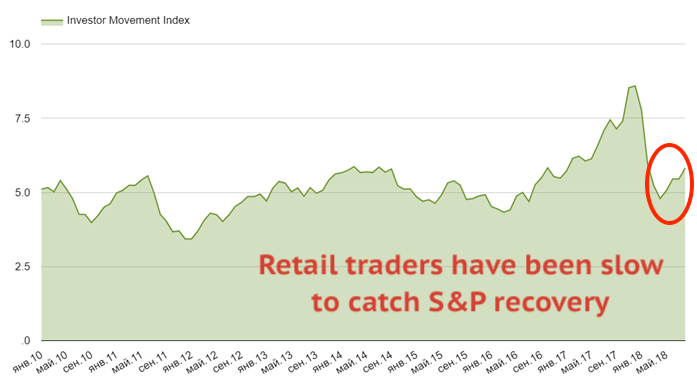 Retail investors renewed cautious calls of US stocks as the S&P 500 continues to set new records. But it’s probably to late to catch a move. According to Investor Movement Index (IMX) retail investors and traders increased their bullish wagers on the US stock market in August – the index grew from 5.45 to 5.82 points. In July it remained unchanged compared to June. Recall that IMX is calculated by the brokerage house TD Ameritrade, which client base is more than 6 million accounts, majority of which are non-institutional investors. The index of retail sentiments hit a record high in December 2017, just a month before the collapse in the US stock markets. In April, the index reached through and then began gradual recovery, but February crash show s that it takes much more time for retail side to shrug off from fear and losses. Typically they are the last persons to receive important market information, that’s why they often became marginal buyers, i.e. buying stocks right before a crash. Slow recovery tells us that retail traders are quite cautious to buy highs as it’s quite difficult from a psychological point of view. In addition, concerns over trade “wars” between the US and China are growing. In our opinion, IMX’s rally to the highs of December may be a signal that it’s time to start selling American shares and taking profits on them. Usually non-professional market participants are often late to the party – when “music stops”. 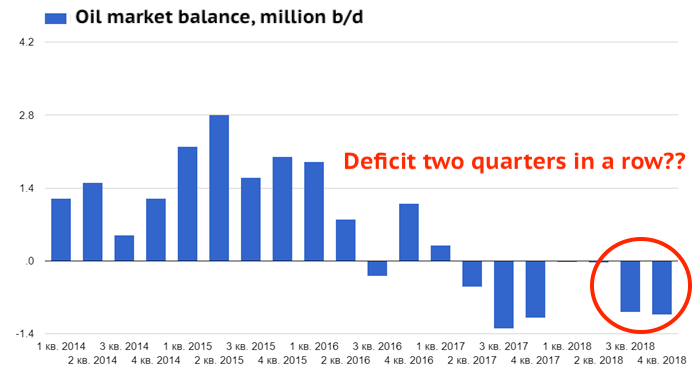 OPEC updated data about it’s aggregate output – second quarter in deficit in a row?? Crude oil production rose to 32.6 million barrels per day in August. Compared with July, production rose by 278K barrels. Three OPEC members contributed to the positive change in production – Libya, Iraq and Nigeria, their extracted amounts increased by 256, 90 and 74 thousand barrels, respectively. At the same time US sanctions has finally fed into Iran exports which has decreased by 150 thousand barrels. According to results of the third quarter of 2018, world oil consumption, according to OPEC forecast, will reach 99.38 million barrels per day, while the world supply except OPEC barrels will amount to 65.91 million barrels. Thus, if the OPEC production remains at the August level then the oil deficit will increase to 1 million barrels per day. Similar market conditions are expected in the fourth quarter. Production of crude oil in the US has stalled at around 11 million barrels. Russian oil production is also not planned to increase this month. That is, if OPEC refuses to sharply ramp up production, then in the next quarter crude oil market can tighten further, falling into deficit. Oil deficit by 1 million barrels per day is unlikely to allow a significant drop for the oil prices. However, OPEC’s forecast for global consumption may be quite optimistic.